Happy Holidays from "The Brady Bunch" or "Hollywood Squares" or how about just "The Sheridan Avenue Gang"
this is so great!!! what a fun idea for a card! To this day, i will never be able to comprehend how you get the pooches to pose so well every time. So cute! Happy Holidays to you guys too! Adorable shots of all of you! Merry Christmas to you all....! Love this collage of everyone! Fun picture. Merry Christmas everyone! Fabulous card, Jodie! Hope your Christmas was merry and bright! This is Awesome! Love….Happy Holidays to you and your gang, too! This is ridiculously adorable! Too cute! Your boys are the cutest, most photogenic pups, with such expression in thier faces. You always capture a perfect photo, too. Great skill you have! This is wonderful, Kay! 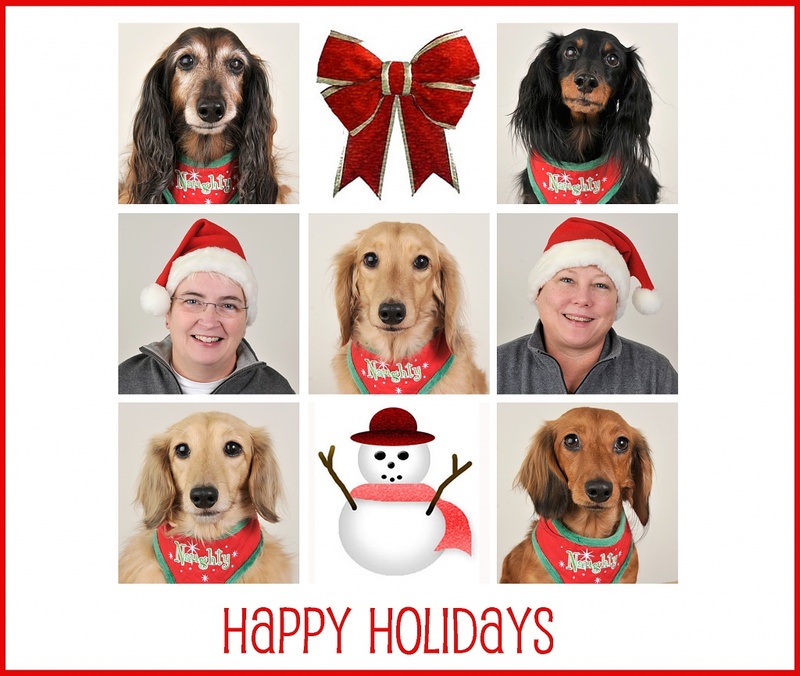 Love the simplicity of the collage...you all look very merry and bright ;-) I hope you had this made up early enough to send out...otherwise attach it to an email and send it our to your family and friends today. It really is sweet! This is a gorgeous holiday card!....Next year I'm hiring you to do our holiday cards (air fare and accommodations included!) I totally forgot to send out cards this year...can you imagine!?!?!?! ohhhh love it!!! i agree, amazing holiday card! Priceless! You couldn't have pulled together a more wonderful or appropriate Christmas card! Love and Happy Holidays to all of you! What a wonderful family photo. Although I look forward to your photos, every day, I'm sorry to see number 365 approaching within the week. Please don't leave us. Let the boys know that I asked Santa to bring me, at least, another year of having them appear daily. Being a HUGE fan of the Brady Bunch when I was a kid, I love this!!! It is not often that everyone in a family looks good in the Christmas card picture but you did it! Merry Christmas to all the residents of Sheridan Ave.
Love it,. I hope all of you had a great Christmas! This is awesome, made me smile! This is just the cutest! I love it! Merry Christmas to you all too! Very nice card. Thank you for this Christmas cheer. hehehe, what a brilliant collage! This is so cool! Looks like a post card ))) Happy Holidays!